You are in business to serve an outstanding meal to your clientele. They will not come back if your cooking products are sub-par and prepare dry, undercooked, or tasteless food. In addition, once ordered, no one likes to wait and wait for their meal. Promptness and proper preparedness of your food are the cornerstone of your business. Only a top level commercial oven that will do the job efficiently and economically should be acceptable to you. A wide selection exists whether you select from conveyor models to convection, Vortex Restaurant Equipment has the right type of Commercial Ovens for your pizzeria, bakery, cafeteria, and other foodservice operation. The Alto-Shaam electric rotisserie is constructed of a heavy gauge, non-magnetic stainless steel with a sealed cooking chamber for heat retention. Low-e glass on front includes a handle with magnetic door latch. With the same power, consistency and precision as the rest of our line, the CT Proformance™ 10-10 Combitherm® oven is not as deep as the CTP10-20. The CT Proformance™10-20 oven is perfect for placement in institutions like universities or schools where the demand for quantity and quality is high. The CT PROformance™ 20-10 Combitherm® oven is a roll-in model that provides high volume production in limited hood space. It is compatible with the Alto-Shaam integrated rack management system. The CT PROformance™ 20-10 Combitherm® oven is a roll-in model that provides high volume production in limited hood space. It is compatible with the Alto-Shaam integrated rack management system and is perfect for cook/chill. A key part of our fully integrated banqueting system, the CT PROformance™ 20-20 Combitherm® oven is equipped with a roll-in cart that allows you to cook food and then roll it into the compatible Alto-Shaam CombiMate. Perfect for the line or production, the CT Proformance™ 6-10 Combitherm® oven has the ability to steam, bake, braise, roast, oven-fry and retherm. Our most popular model and the industry standard, the CT Peroformance™ 7-20 Combitherm® oven has the power and capacity to keep up with even the busiest of kitchens. Our most popular model and the industry standard, the CT Peroformance oven has the power and capacity to keep up with even the busiest of kitchens. The CT Express™ is the most compact Alto-Shaam combi oven ever with full-size performance and the capacity to hold five (5) full-size hotel (or GN 1/1) or ten (10) half-size sheet pans. The XL-300 is a hi-speed cook oven with an internal catalytic converter, forced impingement convection and single magnetron microwave technology. The XL-400 is a hi-speed cook oven with an internal catalytic converter, forced impingement convection and dual magnetron microwave technology. 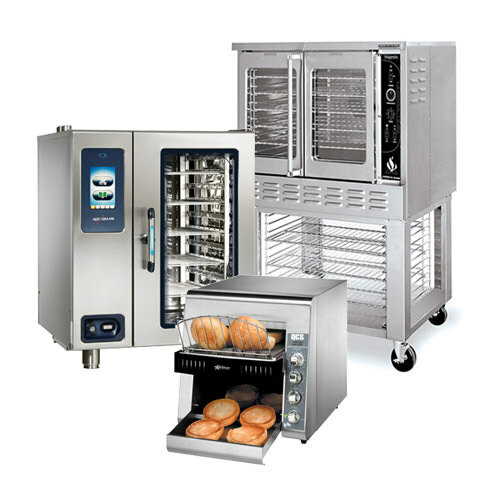 XPRESS High Speed Combination Ovens deliver on a variety of levels. They are more compact, more efficient and more profitable than competitive models. When you think commercial microwaves, the top restaurant chains say Amana ovens. In fact, Amana Commercial is the market share leader and the brand more restaurants. American Range presents heavy duty Majestic commercial electric convection ovens. The all stainless steel exterior construction is both robust and durable and accommodates full size sheet pans. Picture is for illustration purpose.